Sorry for the delay. Lots of genuinely good reasons. And now, not-really-a-review: We saw "1408" the day it came out, and I have to say that I still prefer the short story. The original tale is very much an homage to Lovecraft, with quite a bit of other nods to famous horror tropes thrown in -- pictures and objects that change ala M.R. James' "The Mezzotint," mysterious messages on the telephone, etc. But mostly, it's Lovecraftian in tone because 1408 is just plain metaphysically and cosmically wrong. It's a Bad Place in the classical sense of the term. In the film, it's turned more into the private torture chamber of Cusack's character, a place where past fears and suppressed pains meet in a personal hell. This moves the story from "The Dark Descent's" classification of Fantastic horror fiction to a more standard blend of Moral and Psychological, far more akin to something you'd expect to see in the "Silent Hill" games or the film adaptation of the same. 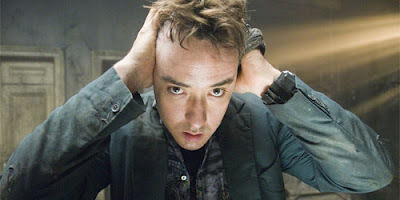 In both versions of "1408," Cusack's character, Mike Enslin, is a skeptic, but he's a skeptic for very different reasons in each variation. That Enslin is a skeptic because of personal bitterness stemming from the death of his daughter. He can't comprehend why God would have taken her, so he chooses to jettison the idea of any sort of deity or life after death out of a palpable and inescapable pain. At one point in the film, he's asked how many faiths he has himself destroyed because of his skeptical writings. Obviously, this is part of his pain and thus, part of his punishment in 1408. The film version of 1408 becomes a glimpse into a private purgatory, the implication (through a clock that resets itself over and over again) that Enslin will be condemned to repeat the same terror-filled hour over and over again until he "check himself out," so to speak. Like the short story, he escapes, but the implications of what this means are again profoundly different, pregnant with (to my eyes) implied Judeo-Christian profundities. At one point, the room is even cast into a Dantean chill, and Enslin drips the 10,000-pound clue that the deepest portions of hell are the furthest from light and warmth. Given the current cultural climate, I'm not suprised that the filmmakers took this route. I realize that adapting any sort of short story to film length requires revision and expansion, but the difference between the original tale and this is pretty radical, even though many major plot points and even salient events are kept. The film adaptation injects an implied good/evil duality that simply has no place in King's original story, and perhaps a further implication of a Guiding Hand leading Cusack's Enslin to a destined appointment with the Evil Room. Samuel L. Jackson's mysterious hotel manager, Olin, seems positively deific in one scene when 1408, now ablaze thanks to Mike's actions, is being consumed forever in hellish flame. "Well done," he intones, eyes aglitter with a grim pride. Don't get me wrong - I didn't demand my money back. But the "1408" of the short story collection "Everything's Eventual" and the celluloid version are very, very different from one another. This is neither better nor worse, but simply an interpretation open to personal preference. I lean toward the Lovecraftian. Others may like the room depicted in the film. I guess it depends entirely on what scares you.